A 40-year-old federal energy law has been making a lot of news in recent months. In June, Montana’s Billings Gazette published a story titled, “Hot Mic Records Troubling Conversation About Solar Regulations.” The solar regulation at issue was the Public Utility Regulatory Policies Act of 1978, or PURPA, which has been an issue of contention at the Montana Public Service Commission for well over a year. PURPA was designed to be a driver of conservation and renewable energy in response to the energy crisis of the early 1970s. The law requires utilities to purchase energy produced at what are known as Qualifying Facilities (QFs) if they match a utility’s avoided cost. "Avoided cost" is defined as the cost equal to or below what utilities have to pay for energy produced by a traditional power plant. In Montana, and in several other states across the nation, PURPA has become a major driver for the development of solar projects. It's a new phenomenon, made possible only by the dramatic decrease in solar prices in recent years. Now, the success that large-scale solar has seen as a result of PURPA is starting to cause a stir. As we detailed in this story, Montana’s largest investor-owned utility, NorthWestern Energy, filed an application with the public service commission in May 2016, asking it to revise its QF avoided-cost rates, which at the time were $66 per megawatt-hour. The utility feared that the generous PURPA QF rates would prompt a rush of solar projects, an argument supported by the Montana Consumer Counsel, which believed the state’s ratepayers would have to foot the bill for an avalanche of expensive solar PPAs. Which brings us back to the hot mic. After more than a year of deliberation, the rates and terms for solar QFs in Montana were scaled back from 25 years of guaranteed pricing to just five, and prices were slashed from $66 per megawatt-hour to about $47 per megawatt-hour, which the solar industry says make it impossible for projects to pencil out economically. Because PURPA’s main purpose is to promote renewable energy and conservation, this acknowledgment that the state’s PURPA terms do just the opposite sounded like a violation of the law. Vote Solar has since joined others in asking the commission to reconsider its decision and has argued that the regulators have violated PURPA, botched the calculation of avoided cost and gone against the Administrative Procedure Act of Montana by not allowing interested parties to weigh in on their decision. Though solar developers and advocacy groups have been at odds with NorthWestern over the PURPA rules, the two may be joining forces to protest the commission’s decision, which also slashed the contract length for the utility’s own projects to just five years of guaranteed rates. Like the solar developers, the utility argues that short contracts make it impossible to build new projects, which NorthWestern and others say are necessary to meet peak demand in Montana. Without sufficient capacity, the utility has to purchase peaking generation on the spot market. Though prices are currently affordable, there’s no guarantee they won’t spike in the future. Hoffman made it clear that the utility could appeal to the state legislature to curb the power of the commission. There’s also the possibility that solar developers could pursue legal action or request further action from the Federal Energy Regulatory Commission, which elected not to intervene earlier this year. But Smeloff believes NorthWestern’s involvement in urging the commission to reconsider its order will carry more weight with regulators. The debate over PURPA rules in Montana may have the most drama and intrigue, but it is not the only PURPA discussion taking place, nor the most consequential. Of far more consequence to the size of the overall U.S. solar market are changes to PURPA in others states, such as North Carolina. 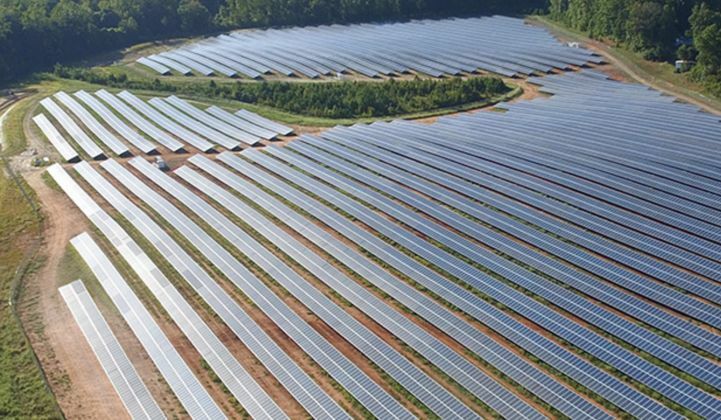 North Carolina’s position as the state with the second-largest installed solar capacity in the nation is largely the result of PURPA-driven projects. Over the past year, Duke Energy has pushed state legislators to change how PURPA functions, in particular allowing the utility to procure a set amount of PURPA projects using competitive bidding that was open to the utility itself. After a lot of controversy and debate, the North Carolina legislature passed, and Gov. Roy Cooper signed, a compromise bill that made several changes to how the energy law is enacted. Most notably, its allows competitive bidding, lowers the state’s avoided cost and ensures that accepted projects receive 20-year power-purchase agreements. The law, which also included a controversial 18-month wind development moratorium, set a solar deployment target of 6,800 megawatts by 2020. In a statement, Cooper commended the solar compromise and lambasted the wind moratorium, the impact of which he attempted to lessen with an executive order that ordered the state’s Department of Environmental Quality to continue recruiting and facilitating wind projects during the moratorium. This approach to PURPA is not what solar developers want -- and many would argue that it flat-out violates the law. But it doesn't signal the death of PURPA projects -- as in the Montana case, or in Idaho, which also changed PURPA contracts in ways that make it virtually impossible to develop solar projects. Later this month, Michigan’s public service commission will hold a final hearing that is expected to cement the state’s approach to PURPA. Though the details won’t be released until after the hearing, for solar stakeholders, the contrast with Montana could not be more stark. The commission process involved some back-and-forth between solar advocates and Michigan’s large utilities, Consumers Energy and DTE, about how to establish the avoided-cost rate, but the goal of using PURPA to spur more development was widely shared. Smeloff expects the ultimate result will provide independent solar developers of projects 2 megawatts and smaller the certainty they need to invest. Yet all of this state-level activity around PURPA may end up being eclipsed by another set of regulations entirely. If Suniva and SolarWorld are successful in their trade case, prices for solar might go up enough that the avoided cost will be unobtainable.